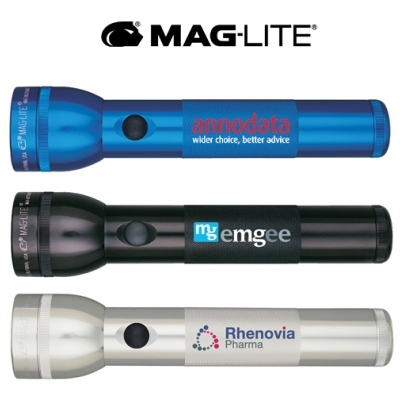 The Mag-Lite 2D with your Full-color Corporate Logo permanently set on the handle. The model provides a large area for your full color logo. New! Full Color Digital Imprint! • Flashlight, 10" in length. • Includes chipboard display carton. • Requires 2-D Batteries; not included. 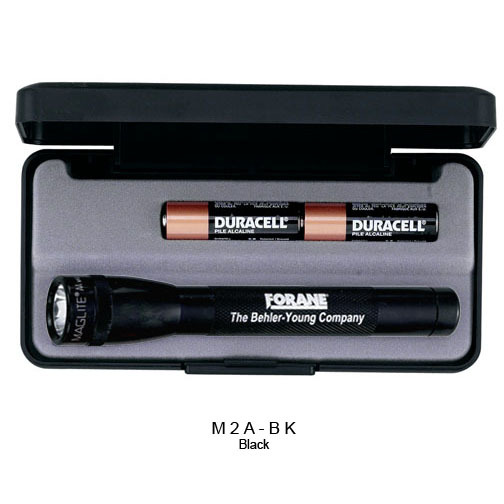 D-cell batteries are available for an additional $1.60 per battery, inserted. Price includes full color printing using four-color process colors (cyan, magenta, yellow and black) on barrel. Additional art charges will apply to convert colors. Exact PMS matches are not possible. Neon and metallics are not available. Imprint Colors: Full Color Digital. Additional Location Engraving: Add $0.85 per item, plus setup, for additional engraving location on opposite side of barrel. Personalization: $0.25 each, plus setup. Production time: Approx. 7 days. 3 Day Rush available (restrictions apply).